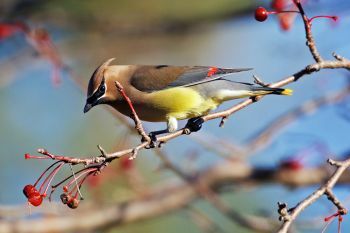 Cedar waxwing at Lake Vermillion Recreation Area. 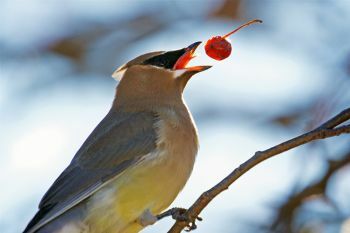 Cedar waxwing throwing a berry he picked down the hatch. 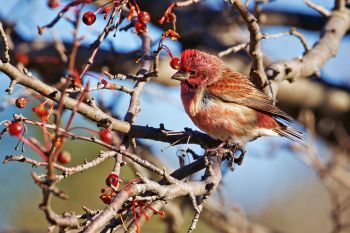 Purple finch at Lake Vermillion Recreation Area. 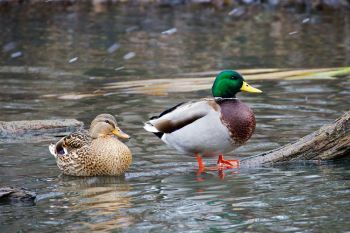 A mallard drake and his lady friend in a light snowfall in early December at the Sioux Falls Outdoor Campus. 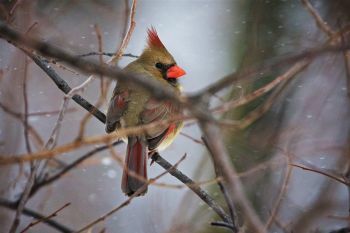 A male cardinal with snow falling at the Sioux Falls Outdoor Campus. A shy female cardinal at Sioux Falls Outdoor Campus. 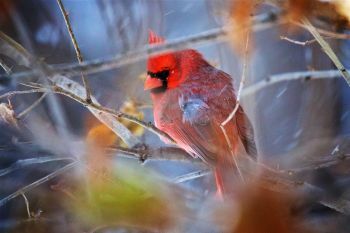 A male cardinal avoiding the photographer in a tangle of branches and unfallen leaves. 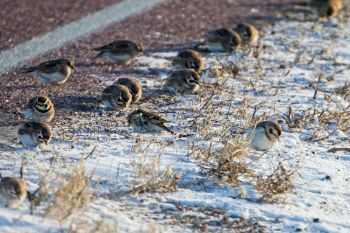 A mix of horned larks and Lapland longspurs dining along the side of a road in subzero temps north of Brandon. 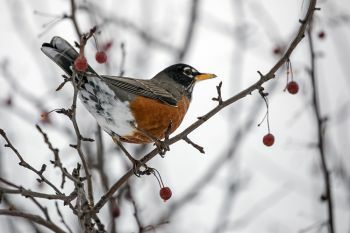 A robin that decided to winter at the Big Sioux Recreation Area near Brandon. 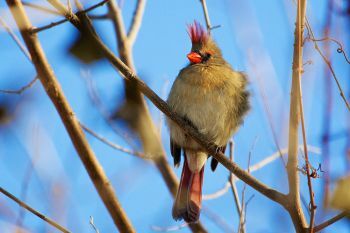 A female cardinal fluffed up in the chilly wind in Terrace Park at Covell Lake in Sioux Falls. 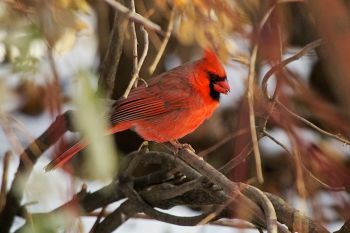 A male cardinal in Terrace Park at Covell Lake in Sioux Falls. 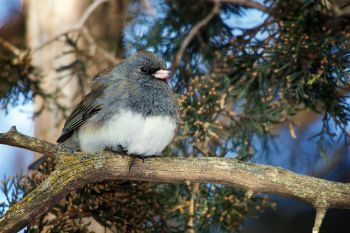 A dark-eyed junco enjoying the winter sunshine at Good Earth State Park. 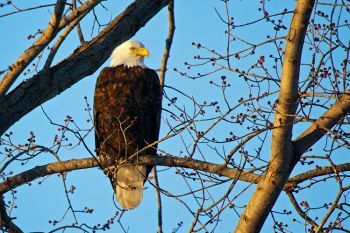 A bald eagle along the road on the east side of Newton Hills State Park. 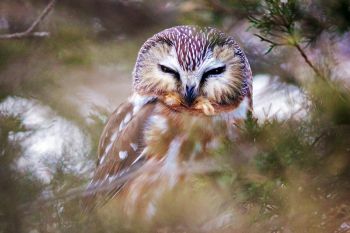 Sleepy Northern Saw-whet owl at Newton Hills State Park. Northern Saw-whet owl at Newton Hills State Park. 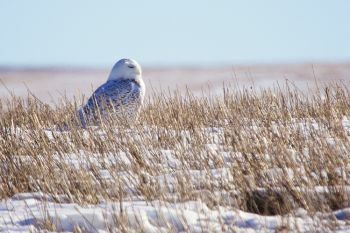 Snowy owl at rest in the Fort Pierre National Grasslands. 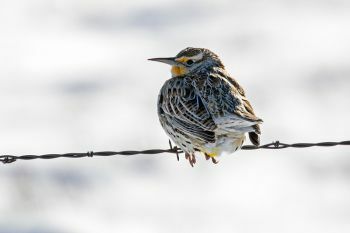 A meadowlark in January north of Aberdeen. 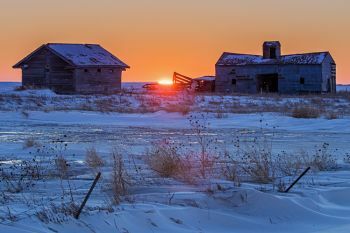 A perk of birding during winter is catching a sunset on the lone prairie landscapes. This one was shot northwest of Aberdeen. You might think that freezing temperatures and wind-driven snow pelting your face would make for poor photography. Normally I’d agree. However, there are certain places I like to go on a snowy day. 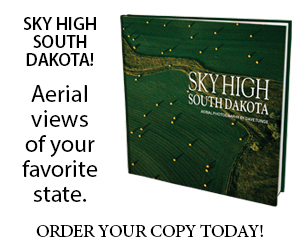 One of them is the Sioux Falls Outdoor Campus near the feeders. 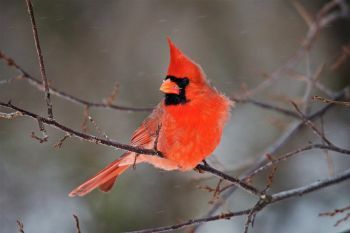 If you are patient, there is a very good chance of spotting one of a few resident cardinals coming in for lunch or hanging around the nearby branches. The brilliant red of the male is always a joy to see, but seems to stand out even more beautifully amidst the snowflakes. Friends and co-workers often tease me about how I’m becoming a birder, as if there’s something bad about that. I’m not a true birder, but I’ve taken more steps in that direction the last few years. True birders are interested in every bird they see or hear. I’m partial to the ones I think look cool in a photograph. True birders can tell you where migrating birds come from and about how long they’ll stay. I have to go to the internet for that kind of knowledge. True birders do this thing called “pishing” to get birds to show themselves and take good long looks at you. I try it sometimes, but I think the birds that show up are doing it more out of humorous curiosity than anything else. 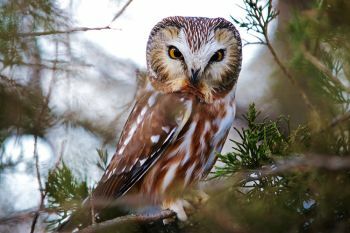 A few Februarys ago, a local birder spent a lot of time looking for the little Northern Saw-whet owl in parks around southeast South Dakota. He reported three of them at Newton Hills State Park. Although these owls can be found along the Missouri River, particularly in the Pierre area at Farm Island and a few other hot spots, I did not know they would come this far south and east. So I went looking too. I failed miserably. On the third visit, I found dead field mice hanging on branches, which is good owl sign, but could not for the life of me spot the owl itself. Finally on my fourth or fifth try, I nearly walked headlong into the owl resting on a young cedar branch in the midst of a tangled thicket. I froze. Usually wild birds flush when discovered at close range. The owl looked at me for about 30 seconds then slowly closed its eyes and went back to sleep. It was an amazing, breathtaking encounter with a winter bird that I’ll never forget. Do seeking out and enjoying thrills like that make me a true birder? Not yet, but I’m getting there.